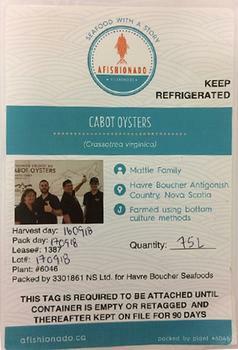 3301861 Nova Scotia Limited is recalling Cabot brand oysters that may be contaminated with Salmonella. There have been no reported illnesses associated with the consumption of the recalled product. Customers who purchased the recall products should not consume them, but discard them or return them to the place of purchase.